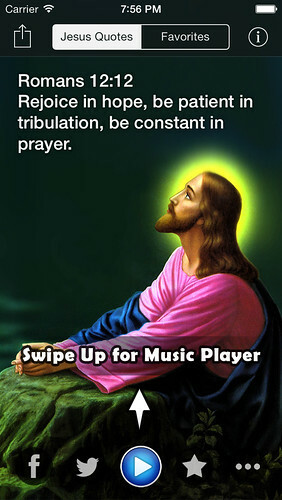 Best daily holy bible verses by Jesus Christ & others that will provide essential boost to your spiritual life, and your family also. ● Swipe left or right to change quote. ● Swipe up to open the music player. ● Tap on the play button to play music. ● Tap on the star button to add a quote to favorites. One of the best part of this app is about the music. It has great inspiring & relaxing songs that you can listen to while reading quotes. Combining the music with the slideshow of quotes & background pictures, you will have a wonderful quote app that you’ve ever wanted. ● 500+ great holy bible verses. ● 20 peaceful & relaxing songs with a nice music player. ● Slideshow for quotes & background pictures. ● Bookmark your favorite quotes. ● Quote notification every day and night. ● Beautiful hand-picked background pictures. Please feel free to contact us if you have any requests or new quotes for this app.